On account of the presence of a copious number of manufacturers, the global heart valve devices market is fragmented in nature. Players in the market are seen competing with one another either on the basis of a diverse product portfolio or on the basis of specific products. A report by Transparency Market Research predicts the competition in the market to heat up further in the years to come on account of the foray of aspiring manufacturers. Majorly fuelling growth in the global market for heart valve devices market is the increasing instances of obesity and unhealthy lifestyle causing various cardiac diseases and pathological disorders. In addition, the increasing demand for minimally invasive procedures and continued product modifications by leveraging the latest technologies developments have brought about more effective heart valve devices. This has also had a positive impact on the market. As per Transparency Market Research, the global heart valve devices market will likely register a CAGR of 12.4% during the period from 2017 to 2025. Rising at this pace, the market which was worth US$5.8 bn in 2016 will likely become worth US$16.2 bn in 2025. Based on the various types of heart valve devices available in the market, the main segments are mechanical heart valves, biological heart valves, and transcatheter heart valves. Among them, the segment of transcatheter heart valve devices accounts for maximum share in the market. In the foreseeable future too, the segment is expected to retain its dominant share on the back of growing uptake of technologically superior products in developed nations, more than average selling prices, and considerably lower mortality rate achieved by the devices. The mechanical heart valves segment can be further divided into aortic valves and mitral valves. Of them, the segment of transcatheter mitral valves will likely see maximum number of product launches by 2025. Meanwhile, mechanical heart valve devices are seeing their demand grow in developing countries as these products offer longer life expectancy if anticoagulation is ensured. The biological heart valves, on the other hand, are predicted to grow at a healthy clip in the near future. However, the segment faces threat from substitutes on account of new technologies such as valves made up of bio absorbable polymer scaffolds that provide therapeutic healing to be launched soon. From a geographical standpoint, North America leads the global heart valve devices market because of the greater uptake of technologically superior products and techniques and comparatively greater average selling prices of heart valve devices in the region. By expanding at a CAGR of 12.4% during the period between 2017 and 2025, the region will likely become worth US$6.92 bn in terms of revenue. Europe trails North America in the global heart valve devices market vis-à-vis market share. The region’s growth has been mainly brought about by the numerous product launches, supportive policies of the government, and a large pool of elderly highly susceptible to various heart diseases. In terms of growth rate, however, Asia Pacific is expected to overtake other regions by registering a CAGR of 13.3% in the forecast period. The region’s growth will be mainly brought about by the high occurrence of heart valve diseases and an improving healthcare infrastructure. Some of the prominent participants in the global heart valve devices market are Abbott, CryoLife, Inc., Boston Scientific Corporation, Edward Lifesciences Corporation, TTK HealthCare, JenaValve Technology, Inc., Medtronic, Neovasc, Inc., Sorin Group, Micro Interventional Devices, Inc., and Lepu Medical Technology Co., Ltd. The global heart valves devices market is witnessing an upward trend due to the increasing prevalence of obesity and adoption of unhealthy lifestyle choices leading to cardiovascular diseases and pathological disorders. Heart valve devices are used for repairing and replacing heart valves sans the need for open surgery. The acceptance of heart valve devices is likely to surge as new devices continue to receive approval from the Food and Drug Administration. The global market for heart valve devices could be segregated on the basis of type, end-user, and region, where the transcatheter heart valve devices by type is predicted to retain the leading share. The preference of physicians and satisfactory outcomes account for high adoption of transcatheter heart valves devices. Transcatheter devices are used to repair and replace heart valves sans the need for open heart surgery. The report prepared by seasoned analysts provides a comprehensive analysis of the worldwide heart valve devices market taking into account growth factors, challenges, and other vital aspects. Majorly fuelling the global market for heart valve devices is the rising prevalence of lifestyle diseases such as diabetes and obesity and lifestyle changes leading to cardiac diseases. High pressure jobs, sedentary lifestyle, and consumption of processed food that are synonymous with urban living are increasingly becoming major cause for diabetes and obesity that can further lead to heart conditions. Apart from this, the increasing preference for minimally invasive procedures which lowers the risk of infections, need for blood transfusion, and even reduces hospital stay due to speedy recovery is serving to boost the demand for heart valve devices. Additionally, continued product upgrade by incorporating latest technologies leading to the advent of sophisticated heart valve devices is also serving to drive growth of this market. Structural advances and design innovations of prosthetic heart valves have proven beneficial for valve replacement surgeries. This is further aiding the rise of heart valve devices market. The adoption of regenerative medicine and in-situ tissue engineering for the advent of bio absorbable heart valve devices is the focus of key players in this market. New players seeking entry into this market will strive to develop innovative products that will help them sustain the competition. 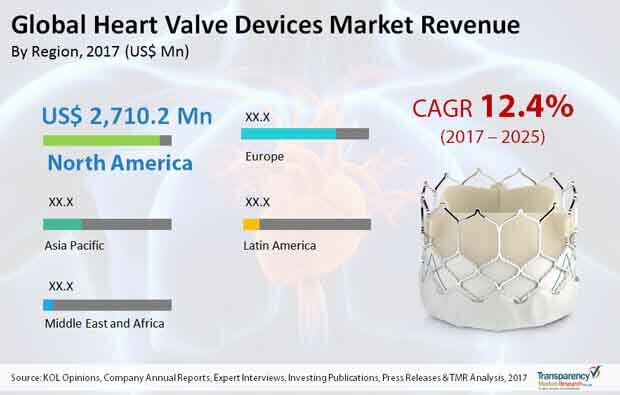 The global market for heart valve devices witnesses the supremacy of North America because of early adoption of technologically advanced products and comparatively higher average selling prices of medical devices in the region. Europe is the second-leading market for heart valve devices. The region’s growth is mainly attributed to numerous product launches, favorable government policies, and a large geriatric population susceptible to heart conditions. Asia Pacific is likely to surpass other key regions vis-à-vis growth rate over the forecast period. The surging demand for heart valve devices in the region is mainly because of increasing incidence of cardiovascular diseases and improving healthcare infrastructure. The worldwide heart valve devices market comprises top-ranking companies such as Boston Scientific Corporation, Abbott, TTK Healthcare, Medtronic, Sorin Group, Lepu Medical Technology CO. Ltd., Edward Lifesciences Corporation, CryoLife Inc., JenaValve Technology Inc., Neovasc Inc., and Micro Interventional Devices Inc. The presence of a large number of players accounts for the heart valve devices market to be fragmented in nature. Expansion of product portfolio and product innovation are the key focus of key players in this market.